The IDF is beefing up tanks aside Gaza with better defense systems in the wake of terrorists’ use of advanced anti-tank missiles. The IDF is deploying the Trophy “Windbreaking” defense system on its tanks in the Gaza Belt in the wake of the use of more advanced and precise anti-tank missiles by terrorists in Hamas-controlled Gaza. The IDF revealed the change in defenses shortly before terrorists lightly wounded a young woman Tuesday morning in a missile attack near a kindergarten on a kibbutz farm. Terrorists have escalated Kassam rocket and mortar shell strikes on civilians and soldiers over the past week, but IDF Chief of Staff Lt.-Gen. Gabi Ashkenazi says he does not think Hamas is trying to draw Israel into a repeat of the Operation Cast Lead counterterrorist campaign that began two years ago this month. He revealed on Tuesday that Gaza terrorists for the first have fired the relatively long-range Coronet missile that was used against Hizbullah in the Second Lebanon War in 2006. The missile hit an IDF tank last week, causing damage but no injuries to the tank crew inside. Lt. Gen. Ashkenazi told the Knesset Foreign Affairs and Security Committee that beefed-up defenses will help deter terrorists from drawing Israel into a sharp escalation of violence. 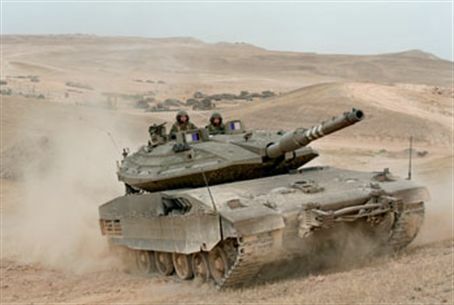 The Trophy system is designed to protect IDF tanks from anti-tank missiles and has been used in a training exercise, with soldiers remaining in their tanks for extended periods of time. The system enables soldiers to neutralize anti-tank missiles at different ranges and can operate in all weather conditions. It was developed after the Second Lebanon War, in which Hizbullah surprised the IDF with the use of advanced Russian anti-tank missiles smuggled into Lebanon from Syria. The IDF had planned to hold a live test of the Trophy Windbreaking system on Wednesday, with a live missile fired at a tank manned by officers. However, the test will be conducted without explosives. It will employ a dummy round that cannot injure the soldiers or even seriously damage a tank. Parents of fallen soldiers have protested the exercise and asked Chief of Staff Ashkenazi to cancel the demonstration.